One of the larger mid-size crossover SUVs on the market, the 2017 Chevy Traverse in Cincinnati, OH is actually a three-row vehicle that can hold a lot of both people and cargo, making it a great choice for those with families. Apart from the spacious and versatile interior, there are plenty of other reasons why the family man (or woman) should consider the Traverse, and appoint it the designated flagship of your fleet. The performance is not just adequate for a larger mid-size SUV — it’s actually impressive. While the fuel economy and performance are average, the towing capacity is its surprising aspect. On top of that, it has a pleasant and comfortable ride quality to it. The new Traverse also received top safety scores from both the NHTSA and IIHS in government crash testing. Since safety is one of the most important aspects when it comes to a family vehicle, the Traverse is worth it alone for those scores. The 2017 Traverse has carried over unchanged from last year. The only difference is the top-of-the-line LTZ trim has been renamed Premier. It still has all the same range-topping features as the LTZ, it’s just under a different name. Perhaps the best quality of the Traverse is its core concept: it was designed to please the entire family. Alongside the space and safety, it also has plenty of technology features. Most important is the built-in 4G LTE Wi-Fi so that every member of the family can stay connected on long road-trips, thanks to the Traverse’s ability to connect seven devices at once. SiriusXM Satellite Radio, Pandora Internet Radio streaming, Bluetooth wireless technology, and three USB ports provide plenty of ways for the driver and passenger to play music. All of which can be operated through an available 6.5-inch diagonal color touch-screen MyLink display. Bottomline: the Traverse is a vehicle where fun, safety, comfort, and space meet. A place perfectly suited for the whole family. Powering the 2017 Chevy Traverse is a sole engine option: a 3.6-liter V6 engine. This engine produces 281 horsepower and 266 lb.-ft. of torque on the LS and LT trims. On the range-topping Premier trim, you’ll be able to harness 288 horsepower and 270 lb.-ft. of torque, thanks to the added dual-exhaust outlets. Just like the engine, there’s only one available transmission, which is a six-speed automatic. However, consumers can choose between either front-wheel drive or all-wheel drive. Except for the Base LS trim, which is front-wheel drive only. Fuel economy stands at 15 mpg city and 22 mpg highway for front-wheel drive models, and only 1 mpg less for combined gas mileage. Dropping down to 17 mpg combined on the all-wheel drive model, as opposed to 18 mpg combined on the front-wheel drive model. These numbers all look perfectly average for a larger, mid-size crossover SUV — and they are. Therefore, the performance specs might not seem that impressive. But, they’re not necessarily meant to be. The purpose of the Traverse is to get families safely from point A to point B in a reliable manner. What is impressive though is the fact that the Traverse can tow up to 5,200 pounds, which is a much higher-than-average figure for this class that opens up a variety of towing options compared to the competition. The new Traverse also has an incredibly smooth and comfortable ride quality, which is key for families. Since a bumpy or uncomfortable ride equates to cranky children, and is just an all-around horrible experience for all involved. It’s got safety in all the right places, and that’s the reason the Traverse scored perfectly on NHTSA and IIHS government crash tests. With an array of available safety features, the Traverse becomes an even safer vehicle for the whole family. These available safety features are the latest and greatest offered in the industry, such as: Forward Collision Alert, Side Blind Zone Alert, Lane Departure Warning, Rear Cross Traffic Alert, Rear Park Assist, and a Rear Vision Camera. All of these either use camera or sensors, and are in place to give the driver an audible or visual warning to help avoid a collision. In order to protect you if a collision does, in fact, occur, the Traverse has a high-strength steel safety cage and numerous airbags. One of which is an industry-first Front Center Air Bag, which helps protect the driver and passenger from colliding with one another if a side-impact collision occurs. After the collision, the OnStar Automatic Crash Response System will kick in thanks to the sensors set in place to detect impact. An OnStar Advisor with then automatically connect with you, and ask if you need emergency services. 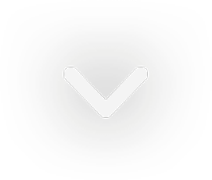 If you do, or you don’t respond, then they will relay your location to emergency personnel via high-accuracy GPS. The 2017 Chevy Traverse has an interior that’s versatile and spacious enough to journey wherever life takes you. Whether you need space for up to eight passengers (the whole family), a combination of passengers and cargo space, or just a lot of cargo space with room for two. Regardless of what type of interior configuration you need, the Traverse is able to provide it. 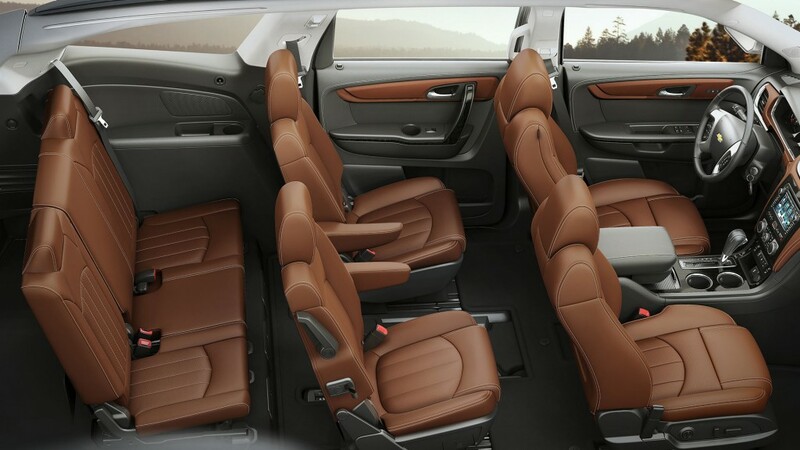 For a long road trip, the eight-seat configuration still allows you plenty of room for family necessities. The interior is so spacious that a full-size cooler fits comfortably centered between the corners of the front and second row seating, without obstructing passenger legroom in any way. If you need more space and have fewer passengers, then the second and third-row seats fold completely flat into the floor. Offering up to a maximum of 116.3 cu. ft. of storage space, effectively landing the new Traverse best-in-class maximum cargo space. With all the seats up, you get 24.4 cu. ft. behind the third row, still plenty to pack the necessities. As far as aesthetics and quality goes, upgrading to the higher trim levels lands you a surprising amount of luxury. The Traverse can hold its own, even against rivals like its Buick relative, with provocative leather and wood finishes. And, as you saw above, it also has plenty of features to keep up with other high-end vehicles. 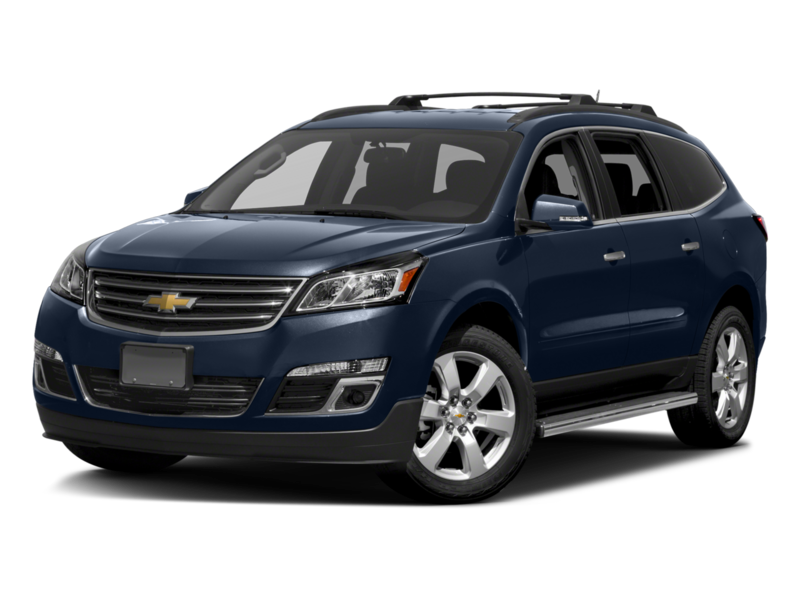 Looking for a 2017 Chevy Traverse? Turn to McCluskey Chevrolet, your certified Chevy dealer for the Cincinnati, OH area. Apart from the Traverse, we also carry an extensive collection of the latest and greatest Chevy models, along with a variety of used vehicles, and certified pre-owned Chevy models. As an experienced dealership, we know that great customer service goes hand-in-hand with selling great vehicles. Since Chevrolet offers nothing but the best quality when it comes to vehicles, we take it upon ourselves to offer nothing but the best customer service. The moment you walk through the door, you’ll be greeted with a hand shake and a smile. Then, our sales team will help you find the car that’s right for you. We have a financing department if you want help finding the best loan, and our expertly trained technicians in the service department will make sure your vehicle stays happy and healthy for years to come. What does it all add up to? McCluskey Chevrolet is your one-stop shop for great cars with great prices, paired with stellar customer service.